more success adapting to the bee’s schedule, than they will to yours. nucs for late April-June arrival. February: This is a slow month for the bees. Late in the month, some queens may start to lay eggs. entrances for blockages of bees and/or snow. hardest part of winter only to starve in March. If honey reserves are low, feed candy or dry sugar. 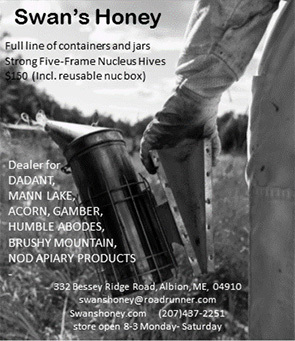 to strong hives with plenty of honey stores in mid-March. Set up equipment for new packages/nucs. Install bear fences if your apiaries are in areas with high bear activity. they have drawn out the comb in their brood chambers. hives for population buildup and swarm prevention. Varroa populations. A mite treatment may be necessary prior to supering for the fall honey flow. queen if there is a problem. Keep an eye on smaller hives for signs of robbing. attending the MSBA Annual Meeting in October. October: Finish feeding syrup by mid-October. Attend the MSBA Annual Meeting. moisture absorbing material by Thanksgiving.